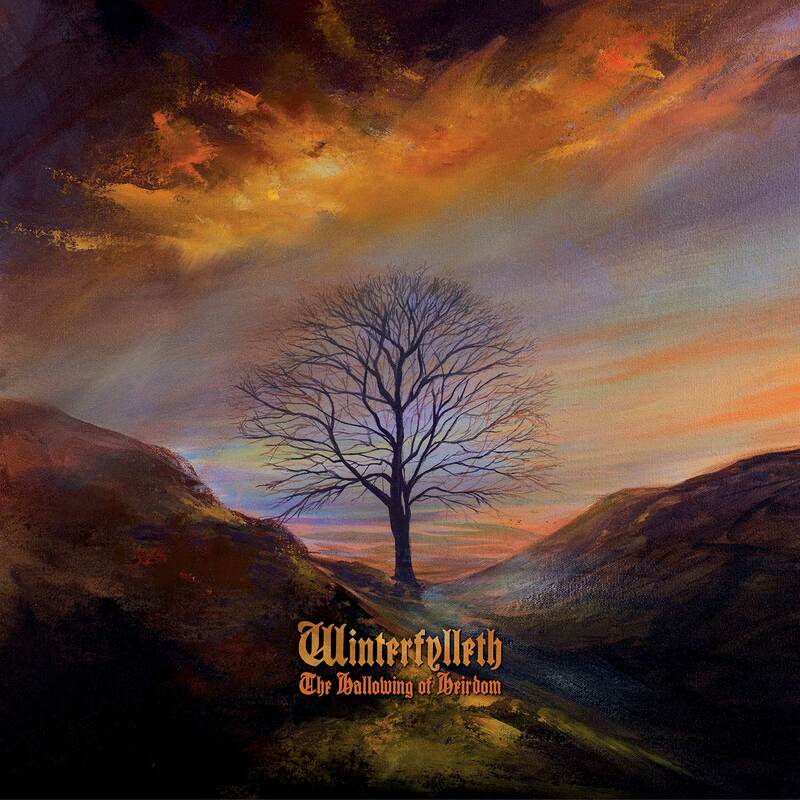 Formed in 2007, Winterfylleth are now on their sixth full-length release, The Hallowing of Heirdom. When translated from Old English, their name means “Winter Full Moon,” also interpreted as pointing toward October. Like their cousins, Primordial, Winterfylleth have built their band up around the concept of propagating their own folklore and heritage; in this case, English heritage as opposed to Irish. The band themselves have classified their music as “English Heritage Black Metal,” a unique twist on a subgenre of Metal that is often overcast with the Scandinavian scene. If pressed to label the band, they seem to neatly fit into the subgenre of Atmospheric Black Metal alongside bands such as Ukraine’s Drudkh (who also have an amazing new album, by the way) and American titans, Wolves in the Throne Room. All of this is predicated on their previous five full-lengths, however, for with this new album, Winterfylleth have expanded upon their folk leanings and crafted an album filled solely with acoustic instruments. This should not come as a shock to fans for the band hinted toward this fetish most recently as 2014’s The Divination of Antiquity in which “A Careworn Heart” was partially acoustic and “The World Ahead” was a completely acoustic song with similar vocal patterns to those present on the new album. “The Shepherd” is the first track on the album and is sure to floor the listener upon first playing it. It’s truly the best song on the album featuring hypnotic clean vocals sung as a round complimented by stellar fingerstyle classical guitar and violin played over the top giving the feeling of sitting atop one of the many mounds in Wales and looking across the sea of green and the silver sky. Delicately plucked classical guitar passages with violin swirling around the melody characterize the fifth track, “Elder Mother.” When the vocal harmonies are introduced, power and depth are truly added. The sixth song, “Embers,” features a major scale riff played somberly resolving into an emotive gorgeous line. “The Nymph,” the ninth track, opens with eloquently strummed chords that graduate to finger-picking over which a female narrates in concert with the cello providing the mesmerizing low end. A prominent cello and violin take the lead in the melody of the tenth track, “On-Cydig,” while the guitar remains gently plucked underneath. The title track and also the last offers a darker, gloomier feel serving as a dirge of sorts, but the song truly opens up with the advent of powerful vocal harmonies causing the song to soar. The Hallowing of Heirdom is, without doubt, a majestic and monumental album evoking myriad feelings and images. That is not to say that it is without fault, though. In the near-hour taken up by twelve songs, some of the fat could be trimmed in order to give more weight to the album’s better parts and allow it to better flow. That being said, one cannot deny the feeling of awe that overwhelms the listener particularly during the first track where one feels as if seated in a dimly-lit old tavern listening to the old tales sung by the band with others sheltering from the road. It is every musician’s goal to invoke a certain feeling or image in the listener, and one can practically smell the campfire, hear its roaring crackle, and feel its warmth while listening. How many other bands have the courage to strip totally naked for their audience as such? Not only is this a courageous record, but it proves a long-lasting point, a testament to the band’s art and longevity. If only all the naysayers who claim Metal is just noise could be gathered to listen to the beauty and maturity present on this album. Metal fans have the right to feel elite for what other genres of music can be stripped of all its technology and hold its own? In fact, this album proves the superiority of Metal as these songs speak with the words of the ancients and will truly live on unlike “Pop music” and its shallow, lifeless offerings devoid of true meaning and substance. In the way Black Metal uses dissonance to conjure feelings of cold, isolation, and hatred, Winterfylleth uses fingerstyle classical guitar, clean vocals and harmonies, and string instruments to paint the picture of the rich heritage of ancient British folklore. Though not a perfect album, The Hallowing of Heirdom proves once and for all that Metal is truly in one’s blood and not just the sum of certain instrumental criteria. One has to wonder, though, how this will transform the band’s live set.